As Transmission Operators, regardless if you are regulated or deregulated, private or government-owned, you are facing new challenges as you operate the increasingly complex, dynamic, and constantly evolving modern grid. Regulatory and legislative changes, new business models, increased number of smart, interconnected devices, integration of renewable and distributed energy sources, demand response, and power electronics, aging workforce, and increased operation and maintenance cost are only few of the added factors that are transforming the way transmission grids are operated. Yet, you are still responsible for providing a secure and stable system, anticipating and planning for system expansion and the interconnection to all the various types of new energy sources, for complying with environmental and industry regulation, and swiftly to reacting to change in the consumption patterns. As Generation, regardless if are traditional non-deregulated entity, are a renewable energy provider, or an independent power producer, you are facing new challenges, as well: integration and coordination of a more diverse fleet that includes traditional and renewable resources, aging generation fleet management, CO2-free generation, and energy efficiency in a smarter grid environment. To manage such a complex system with so many constraints, you need a reliable, dependable, secure, efficient Energy Management System. A scalable system that can adapt to the dynamics of the modern grid quickly, securely, and reliably. Lowers the utility’s operational and maintenance costs. Proves increased situational awareness that allows the operators to quickly assess the level of risk, drill down to details as needed, and make more informed operational decisions. Integrates distributed energy sources and demand response programs within the context of fee markets. Anticipates the system’s behavior to help better plan and schedule replacement and maintenance of assets. Meets today’s secure system needs with flexible environments including fully redundant primary and backup production, quality assurance, training, and development systems. Platform includes an integrated corporate information system that relies on relational databases from leading providers. 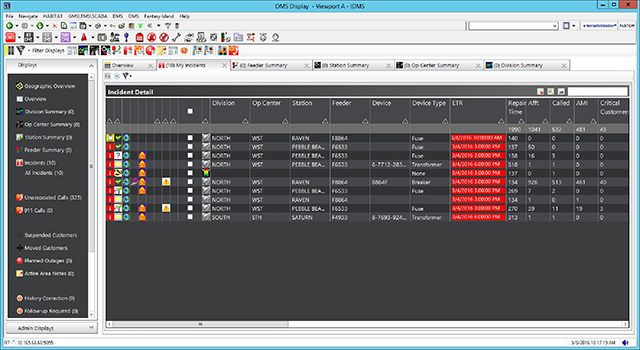 Continuous recording of SCADA measurements has an integrated SCADA journal that helps analyze disturbances and reconstructs important events. Desktop applications can be easily linked to the real-time data through open access API’s to the Platform database. Platform new and powerful graphical user interface (UI) displays data that is relevant to the operators, analysts, and supervisors. The Experience web-based UI optimizes the data and visualizes it in easy-to-use manner. Through a set of power tools, such as Asset Management SOA adapter or the CIM-based modeling environment , you can provide access to any data across the enterprise. Large and small systems alike are target to potential cyber-attacks. Platform provides the highest level of cyber security in the industry. Our cyber security experts are members of various task forces working with governments and industry organizations across the globe, such as USA’s Department of Homeland Security and Department of Energy and NERC and are at the forefront of designing and implementing the latest advancements in this field.